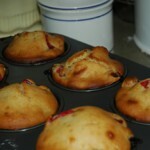 This is my favourite muffin recipe ever; not particularly sweet, packed full of tart cranberries, pretty much perfect. Â If you’re one for the coffee-shop sugar-bomb muffin, you will not like these at all. The original recipe as I was given it included a glaze of sugar and lemon juice that you drizzle over the muffins after they’ve baked, but I never bother because, while it’s delicious, it’s awfully messy. Â And I’m not a huge fan of sugary things. Combine first 4 dry ingredients in a small bowl, sifting well. Combine egg, milk, oil honey, and lemon rind in a large bowl. Stir just until dry ingredients are moistened. Fold in cranberries. 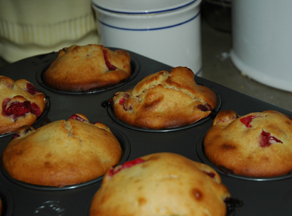 Spoon batter into greased muffin tins. Bake at 400 F for 20-25 min or until golden.